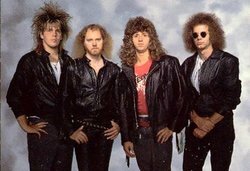 Bad fashion amongst heavy rock bands did not discriminate – as proven by the two attached photos of Christian metallers White Cross. 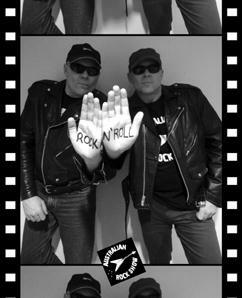 The Rockbrat, could have a genuine contender here for the band who could take the title – as evidenced that two photos are required ! 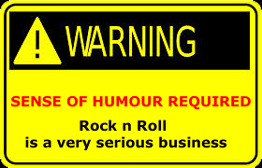 Image one: Let’s take a look guy on the right – he could only be the drummer right ? The shades/headband/wristband look was an 80’s favourite, and here, he is wearing a sleeveless spiderweb shirt with the obligatory spandex to match ….AND he’s gone the tuck ! His name by the way is Mark Hedl…onya mate. He wouldn’t be out-of-place in Toto, Foreigner, Loverboy etc – he has ‘that’ type of look happening. To his left is bassist John Sproule – at this point escaping the Rockbrat target apart from a slick-sided hairdo, at odds with the HM long hair genre, but who really comes into his own on the second image. To his left is vocalist Scott Wenzel – looking dapper in a sparkling silver shirt….’wear this one for the photo shoot honey’…his wife probably offered earlier that day. Maybe it came out of her wardrobe ? To Scott’s left is the clincher – the real star of the image. The most unlikeliest looking HM star you’d come across….guitarist Rex Carrol. Dressing head to toe in black leather does not take away from the fact you are Mr Receder and a Ranga to boot. Rockin’ Rex is also undertaking the ‘I’m going bald but I’ll grow a beard to shift the attention away from my bonce’ routine to minimal effect. 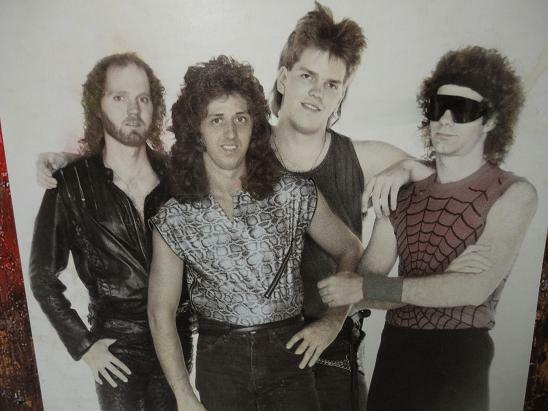 This second image has long been a personal Rockbrat favorite…this image (along with one of System Of A Down) was probably the inspiration behind for this post – though in SOAD’s case it would be ‘worlds ugliest HM band of all time’. Each band member is individually unique in their own way. At first glance it would appear that the boys have let the locks grow – even Rockin Rex (a miracle!). Firstly on the left we have big Johnny Sproule, once again persisting with the ‘do’ at odds with – not only the other members, but from the metal genre itself. Points for individuality. To his right is Rex – who has once again reached for his leathers before the photo-shoot. His hair – well the straggles at the back – have sprouted – unlike the front. He looks damn ridiculous. As for vocalist Wenzel – his long distorted face gives the impression he is grimacing in pain….maybe he was ? Finally we have drummer Hedl – who once again is nearly out doing his bandmates (except Rex). The frizzy hair with John Lennon shades is not working, but it don’t really matter. To be fair to Whitecross, the Rockbrat digs this outfit and I own their self-titled LP from 1987, which has some killer cuts on it. 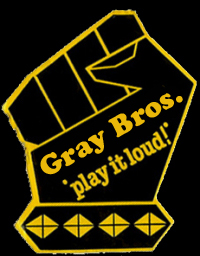 The brother of the Rockbrat saw them at a Hall in Brookvale around 1987 and said they were truly great. I’ll take his word for it. Next !!! !